Left: SBK Fast Dates World Superbike Calendar Kitten Sara likes it! 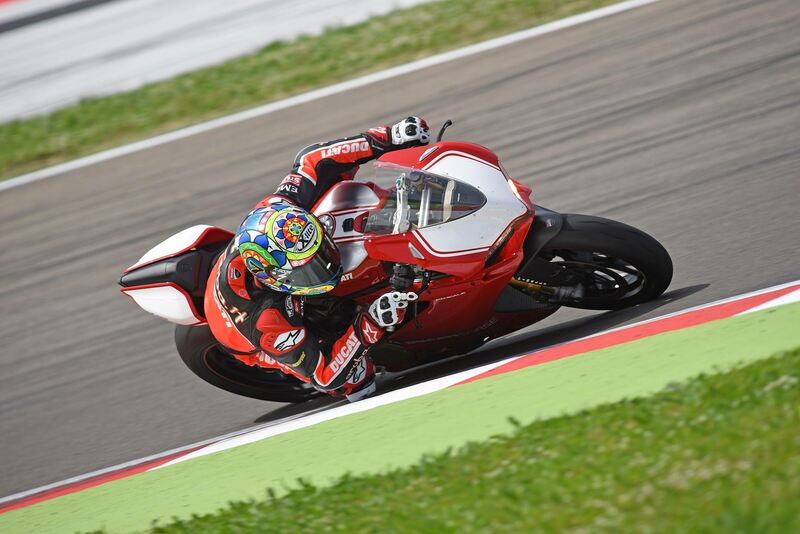 Above: Chaz Davies in action on a stock 1199R15 at Imola - Quick enough to Qualify mid-field in the previous weekend's Imola World Superbik rounde, and probably to win in the European Superstock Class .Just remove the street gear. Right: Our 1199R15 upgraded with the Akrapovic Race Muffler Kit with ECU upgrade, Ducati Corse Adjustable Foot Controls, and a lighter 520 Drive Chain Kit with Aluminum Rear Sprock replaceing the more durable stock 525 Chain and Steel Sprocket. The Ducati R models have always been the homologation models to qualify the Ducati Superbike bikes for FIM World Superbike and Superstore competition with special parts. Those parts were sometimes stronger engine cases to prevent breakage on a highly modified motor, to Titanium engine connecting rods and valves to allow the turn higher RPMs in conjunction with other allow modifications (higher compression pistons, different cams, etc) and hence, make more peak power. Te all new 5th generation Ducati 1199 Panigale Superbike introduce for the 2012 model rear with its new Desmoquadro short stroke engine was to be the best Ducati Superbike yet. In stock form it made about as much power (195hp) as the outgoing 1198RS factory Superbikes, and it would win in the FIM World Superstock Championship. A production 1199R model was introduced 2013 which was essentially a normal 1199 / 1199S Panigalle with just Titanium rods added to the engine for homologation, but power stayed the same at 195hp. But those who tracked the bike and tried to take advantage of the extra 500rpm redline the Titanium rods offered, the rod bearings were subject to failure and many had to be replaced under warranty. And the fact the R13 model didn’t make any more power than the other model Panigale’s was the reason i didn’t want to add the 1199R to my collection of other Ducati R model Supebikes at that time. Meanwhile in World Superbike, Ducati had turned over their entry for the 1199R Panigale to team Althea and their rider Carlos Checa. Meanwhile all of Ducati’s attention and budget at the time was on their expensive MotoGP with Valentino Rossi, and no budget was available to develop race parts for the 1199R. Althea’s 2013 race season with Carlos Checa proved to be a disaster as Carlos found the bike to be down on power compared to the four cylinder competition. With no hopes for an improved 1199R any time soon, Checa choose to retire at the end of the 2013 season. Then few weeks later, with the new company’s takeover by Audi, the budget become available to bring the factory Superbike team back in house for 2014, but they would be starting from scratch in developing the bike for racing. The new 1199R15 is essentially the 2014 Limited Edition 1199 Superleggera which sold for $72,000, less the ‘Legerra’s Carbon Fibre bodywork and higher end Brembo hand controls. The Superlegera made 10 more horsepower up to 2105hp over the standard 1199 Superquaro moto, thanks to a hotter cam, higher compression 13.5:1 pistons, and a new Titanium Akrapovic Exhaust System. It also comes with the Superleggera’s track spec Ohlins mechanical suspension, in place of the excellentt electronic Ohlins Suspension found on the S models and earlier R model. I sorta wanted to get a Superleggera when they were first announced, to comply my collection of all 5 Generatios of Ducati Superbike R models, but i realized the bike was way over priced. And my current modified 1199S with the full Termignoni race exhaust system and lighted to 388 lb weight wet / no fuel also matched the Superleggera power at around 210 hp / 388 lbs. So why spend that crazy money? And I knew Ducati would want to homologate the revised, higher output 2015hp Superleggera motor for World Superstock and Superbike in 2015 by putting it in their next R model, which they now have done. And where the Superleggera motor only got Titanium Intake Valves to replace the steel valves, the new 1199R15 also gets both Titanium Intake and exhaust valves. 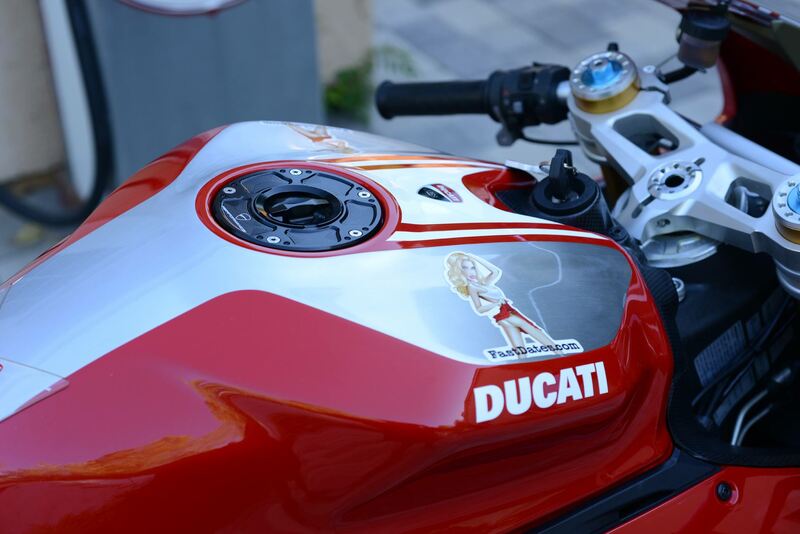 The 2015 Panigalle 1199R is the latest in the long and successful tradition of Ducati selling what it races. It’s been created to meet the specific rules requirement for 2015 World Superbike regulations requiring a minimum of 1000 examples be built for sale. So unlike past years’ R models were only 500 bikes were required by the FOM to be built, Ducati will be building more as customer demand detects, but at suggested retail of $33.995 we don’t expect Ducati to sell many more. The new 2015 model larger displacement 1299 Panigale models offer similar performance, for significantly less money. But the larger displacement of the 1299 doe not allow it to be raced. But like us, for true Ducatista who follow World Superbike, the 1199cc homologation bike is still the Ducati to own. 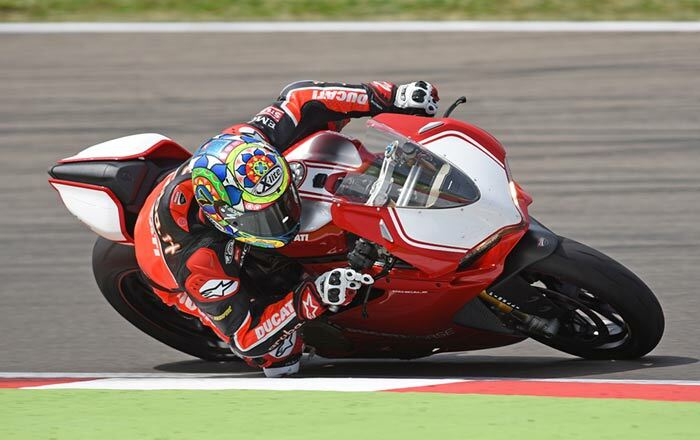 Earlier this year Ducati’s Chaz Davies riding the F15 factory bike finally gave the Panigale its first ever World Superbike race win at Aragon. And then a few weeks later after the WSBK round at Imola, Chaz rode a box stock R15 with its street tires at the press launch to a lap time that would have put him 10th on the past race weekend’s starting grid. Pretty impressive, showing how close the factory race and production bikes are to each other in performance. mechanial suspension. For year 2015 with most production Supebikes now coming standard for the street with electronic suspension, the FIM lifted the ban on electronic suspension for Superstock and Superbike racing, but the new 1199R had already been schedule for production with the Superleggera’s Ohlins mechanical suspension. The new 2015 model R is pretty good deal for USD $33,995 - less than half the price of the Superleggera. 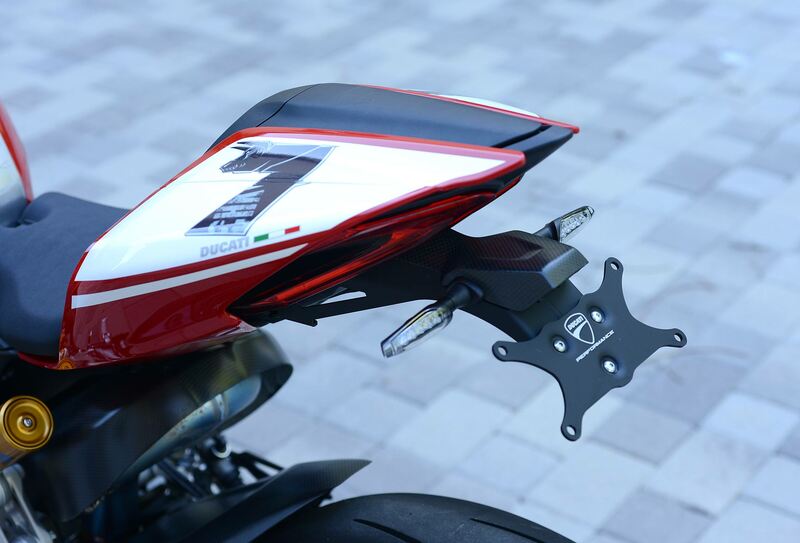 Only about 500 are bring built this first year, though Ducati will keep them in production a sales warrant it, and susposedly they do need to build 1,000 in total for WSBK homologation. Another nice improvement on the new 1199R15, also found on the other 2015 Panigale 1299 models, is a half degree quicker 24° steering head which the Superleggera didn't have, making the R15 is a quicker handling track bike. Prior to 2015 all the Panigale’s came with a slower 24.5 degree fixed steeling angle. If you raced the Corse1199RS you could buy offset steering head races from the Corse race department to quicken up the steering from 24.5 down to 23.5 degrees. But you’re still not ready to ride this 1199R15. 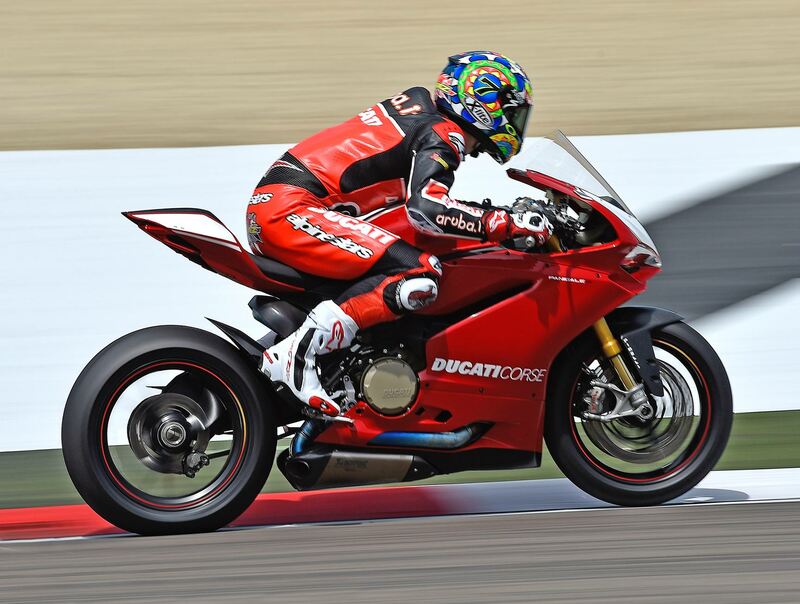 Like all Ducati Superbikes the rear shock spring comes way over sprung for a solo rider. We can understand the regular Panigale are set up to carry a passenger, and as such need a heavier rear shock spring for the added weight. Our Panigale 1199S came with a really heaver 90 Newton / 510 lb. spring. For the single seat 1199R15 Ducati does give you a slightly lighter spring on the mechanical TTX Ohlins Shock spring is spec’ed at Part # 01092-26/85 for 85 Newtons / 485 lbs. For our hefty 220 l.b body weight not including riding gear, we still needed to go 1-step softer on the R15 spring to a #01092 24/80 = 80 Newtons / 457 lbs. So for any Ducati Paginate Superbike , expect to have to pay $100 extra to go to a softer rear spring, which you will need your dealer to install. The DP Corse Billet Fuel Cap looks great, and is 1-pound lighter than the stock locking gas cap. As a long time Ducati Superbike owner and racer I do feel the factory 23.5 degree steering handle setting is the best for any canyon riding and track use. I have a 2012 model 1199S which I love, but to make it ridable to my liking I did have to lower the font forks and raise the rear ride height to make it turn yo my liking. And our new 2015 1199R, despite it quicker 24-degree steeling head angle, it still needs the front fork tubes raise 10mm from stock in the triple clamps (lowering the front end) to get the ideal 23.5 degree setting used by Ducati Corse on their race bikes, and I like to make all my Ducati Superbikes, in order to turn easily. The bike being featured her is my new personal 1199R15 model, and before even picking it up at the dealer I had ordered all the additional parts I knew I wanted, and what made my 1199S15 work so much better. Tops on the list of modifications for the R15 is the Akrapovic Titanium Race Silencers with ECU computer mapping upgrade. With past Ducati R models, you always got the full Termignoni Race Exhaust System in the crate, so you could replace the Superbike’s street legal exhaust system required for any bike sold for street use. The new 2015 1199R models comes with a Akrapovic Titanium Exhaust system, but with restrictive catalytic converters hidden inside the Titanium muffles, and with CARB approved engine making in the bike’s computer. For $2995 the Akrapovic Race Silencers Kit deletes the stock catalytic converters and gives you a higher flowing (and much louder) straight though mufflers with an ECU flash card to recalibrate the bike’s fuel injection mapping for “track use”. The new mufflers are about 8 pounds lighter, and power is increased from 205hp to around 220hp. It really turns the bike into a loud, rasping, snarling beast, making it rev, feel and sound much like a Moto GP bike. 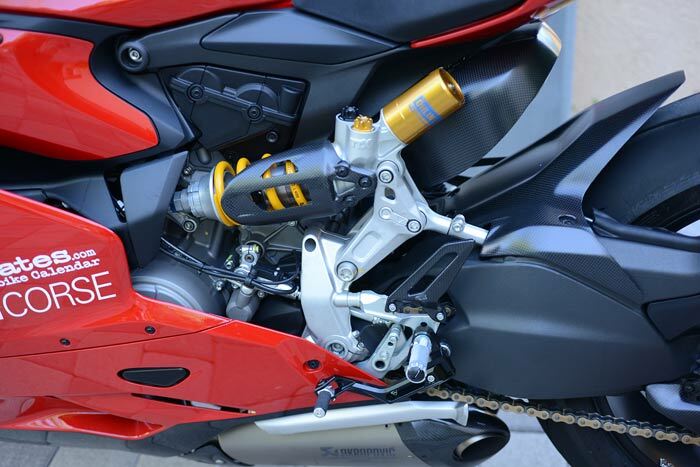 The first part to install include the Ducati Corse Foot Control Assembly, available from Ducati Performance, critical for more cornering clearance, and to replace the slippery stock foot pegs. This is the same Foot Control Assembly used on the factory race bikes, and all the anodized and billet machined aluminum looks so beautiful. I’m actually surprised this didn't’t come standard on the high priced Superlaggera. My next Must Do on any of my Superbikes, and the new Ducati 119915 was no exception, is to replace the stock 525 Drive Chain and Steel Sprockets, with a narrow and lighter 520 Chain Kit with Drilled Steel Front Countershaft and Aluminum Rear Sprocket. Ducati Superbikes are always gears too tall, stock, for noise and fuel economy, so I always go one tooth lower on the front spooked from 15 t to 14T, and one tooth higher on the back from 41T to 42T. This drops the gearing slightly for improved acceleration, but more importantly this setup is a full 2 pounds lighter in reciprocating engine, and unsprung rear wheel weight. The engine now revs even quicker, and the suspension works even better. Ducati Performance accessories did offer this Chain and Sprocket Kit in the past, but surprisingly they don’t any longer. I got my sprockets from the Corse Race Department, but you can get yours from the aftermarket. $33,000 less than a Superleggera and a whole lot faster! The DP Rear License Plate Bracket and smaller Turn Flashes help clean up the rear of the bike, and are easier to disconnect and remove for track use. Those #7 number plate race stickers are from Carlos Checa's 2013 season Ducati World Superbike, and feature a bull's head with horns for Carlos' nickname 'El Toro / The Bull"
Our completed R15 bike tips the scales at 386 pounds with all engine fluids, but no fuel in the tank. For comparison, our 2012 model 1199S Panigale with a Lithium battery and Termignoni Full Race Exhaust and the same other accessories and modifications tips the scales at 388. And our 1199S puts out around 210 peak horsepower compared to, the R’s 220hp. You’ll never feel those 2 less pounds on the R model, and unless you are on a race track you’ll never need the 10 extra horsepower. 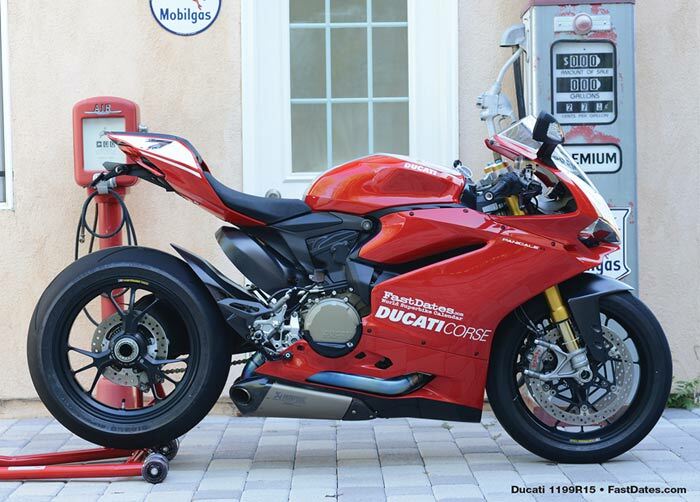 You can probably find a nice used 2012 Panigale S with Full Termignoni Race System on Ebay for under $20,000, which is what i recommedn if you wantt he ultimate Ducati Superbike on a tighter budget. Or possibly opt for the new 1299S. In riding the new R15 the biggest improvement is the aggressive acceleration out of slow turns that was previously lacking in the 1199 Superquadro’s ultra short stroke engine design. The combination of reduced inertia from the lighter crankshaft assembly, reduced friction the Desmo Valvetrain system, and Akropovic’s intensive exhaust development, together with even higher 13.5:1 compression on pump gas and new high-lift camshaft profiles, all add up to the engine’s improved performance, including greater ride ability with improved low down torque. The R15 pulls revs like no Desmo customer bike before it, literally exploding our of corners. You need to keep you foot working the Quicker Shifter like a 4-cylinder Supebike to satisfy the R15s appetite for revs. Unlike past Ducati, you won’t want to ride this bike on its torque curve, but let it rev and pay close attention to the shifter lights that start flashing 1000 rpm below the 12,000 cutoff to tell you to upshift - NOW! Do this and you’ll find yourself still in the incredible power band above 7500 where the acceleration never drops off. And even below 5,000 rpm, as low as 4,000 rpm the R15 still pulls incredibly out of corners. All of the Ducat’is electronic aids are incredible and fully adjustable - now even at the left hand grip with Up / Down paddles. You have DTC Traction Control that now even knows what angle you are leaned over at in corners to compensate perfectly for power application, the adjustable EBS Engine Throttle Baking, DWC Wheelie Control, and ABS Anti Lock Brakes which are also cornering angle sensitive. Everyone is adjustable from high to low effect, or can each can be disabled as you like. Like all the Paginate models, the new R15 steers and handles brilliantly in turns thanks to the way Ducati has compacted the mass of the bike with the frameless design employing the Superquadro engine architecture to hang everting off of. Placing the exhaust system centrally under the engine makes for a bike that is very agile and predictable in the way it changes direction thanks to the way the mass has been compact, and with the aid of the sharper steering angle. You feel as comfortable and in control, cornering the bike at full lean angle, as in riding a straight line. The conventional Ohlins forks gives good front end feel, and the incredible Brembo mono block brakes have unmatched stopping power and control, making braking deep into a turn then letting off the brakes to keep up turning speed. Then get ready for how fast the new engine will spin up and blast you out of the corner,and down the next straight to do it all over again. It is sheer joy. After three years ignoring its reinvention of its best generation Superbike ever, Ducati now has a proven race winner. The New Paginate R is one of the most thrilling rides any Superbike enthusiast can hope to achieve, at any price. One that now performs as well on the race track, as it looks on your driveway. We replaced the stock Ohlins shock spring Part # 01092-26/85 rated at 85 Newtons / 485 lbs .for a 1-step softer #01092 24/80 = 80 Newtons / 457 lbs spring. You will also need to reduce damping a few clicks softer as well. The Adjustable Shock Linkage comes set in the "Straight Rate" position which is the ideal for a smooth paved race track, but for street use with more bumps and bad pavement, flipping over the link insert to the "Progressive" setting is best. Note the DP Corse Billet Foot Controls..
Left: Chaz Davies in action on the stock 1199R15 at Imola - Quick enough to Qualify mid-field in World Superbike, or to win in e European Superstock Class. Above: The 520 Chain Kit we installed use one tooth smaller drilled steel Front Primary Sprocket, and one tooth more on the aluminum Rear Drilled Sprocket to keep the same chain length / wheelbase as stock. The weight reduction is a huge 2 lbs difference in unsprung and rotating weight, while a slightly lower gearing also improves acceleration.